$67,500 ​for essential teachers and staff. The new LGEF Dean's List of Realtors. Read more below. A high-quality education requires more than the state provides. Your donation to LGEF funds much needed supplemental teachers and staff for the children of Blossom Hill, Daves Avenue, Lexington, Louise Van Meter, and RJ Fisher schools. See what LGEF funds. 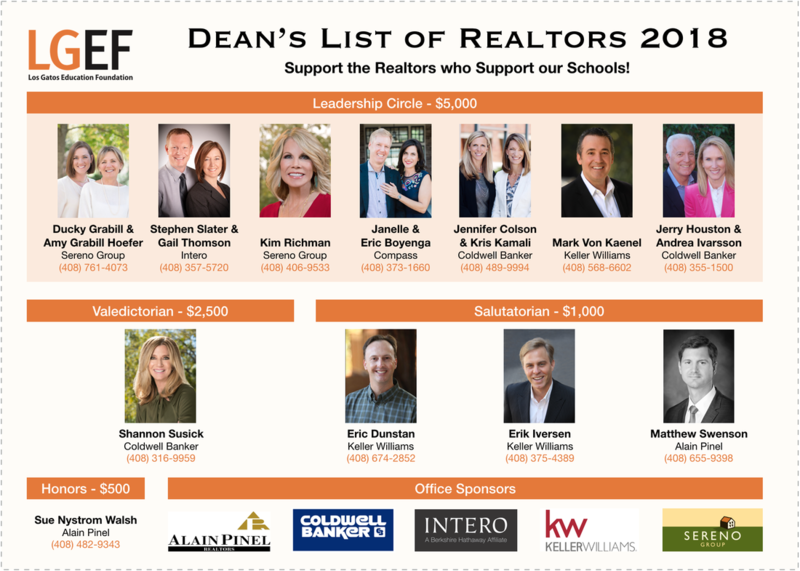 LGEF is delighted to announce the new 2018 LGEF Dean's List of Realtors. With $67,500 in donations for our schools the new LGEF Dean's List of Realtors program has been a smashing success. Los Gatos is fortunate to have generous, engaged realtors. Many have put their own children through our schools, or have children in the schools now. Regardless, they realize that school quality is important to their clients, our families, and our town. Realtors who donated this year are the "founding members" who made this program possible. Every one of them has clearly shown they care about our community. When you see these realtors around town please thank them and let them know you appreciate their support of our schools!